When police went to a woman’s house in Ballymena to speak to her about a breach of bail she said she needed go and get her coat but fled through a fire escape in a bid to escape and broke her ankle. 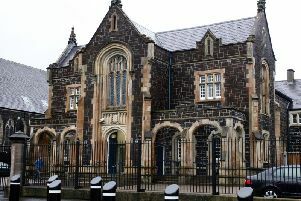 Kelly McKee (25), of Hill Street, Ballymena, appeared at Ballymena Magistrate’s Court on Thursday and admitted resisting a police officer during an incident on May 2. She appeared in court on crutches which defence barrister Aaron Thompson confirmed she was using in connection with her ankle break. “You couldn’t write it,” he told the court. The court heard McKee, who is originally from Larne, had 96 previous convictions and Mr Thompson said his client had a “pernicious heroin addiction”. He said his instructions were that criminals had previously brought the drug to Larne and “gave it away free to get people addicted”. Mr Thompson said McKee is currently accused of a number of offences in the Larne area and that case has been sent to the Crown Court. That was a reference to McKee being accused of attempted fraud by false representation involving trying to use a bank card to place a £3,000 bet at a bookmakers. She is also accused of a similar offence involving a £1,000 bet on the same date - January 18 this year. She faces a total of 56 charges including one involving the alleged theft of £100 worth of meat from a shop; one count of theft of a wallet, cards and cash; and 54 charges of fraud by false representation. Mr Thompson told Thursday’s Magistrate’s Court sitting that McKee was granted High Court bail and when she breached it police went to her house to arrest her. Deputy District Judge Peter Magill told McKee she had demonstrated “incredible stupidity” in trying to flee from police and “look at the price you paid, a broken ankle”. Giving her a two years conditional discharge on the resisting police charge he added: “I think a broken ankle is a sufficient penalty”.